Two stories dominate this week’s harvest report. The first is the continuation of near perfect weather for harvest across eastern Washington. The second is the potential threat of smoke from a number of large wildfires. Let’s start there. Due to the long, warm dry spell this season, a series of large wildfires are burning in eastern Washington and central and southern Idaho. 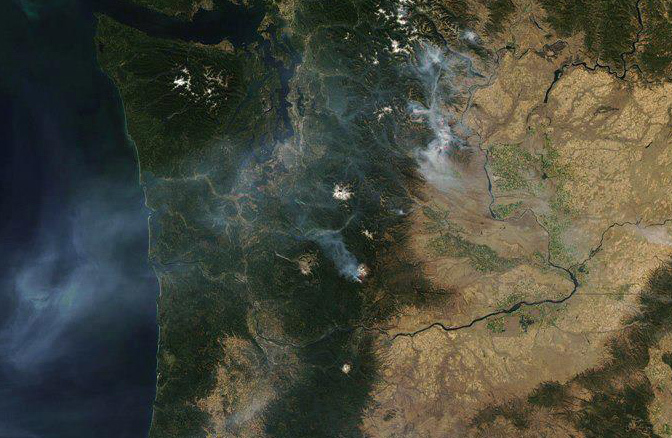 Smoke from these wildfires has created a haze over large areas of eastern Washington. While most of Washington’s growing regions are far from the flames, others are fairly close. The Wenatchee Complex fire has burned an estimated 42,000 square acres. For perspective, this almost equals Washington’s total planted grape acreage last year. 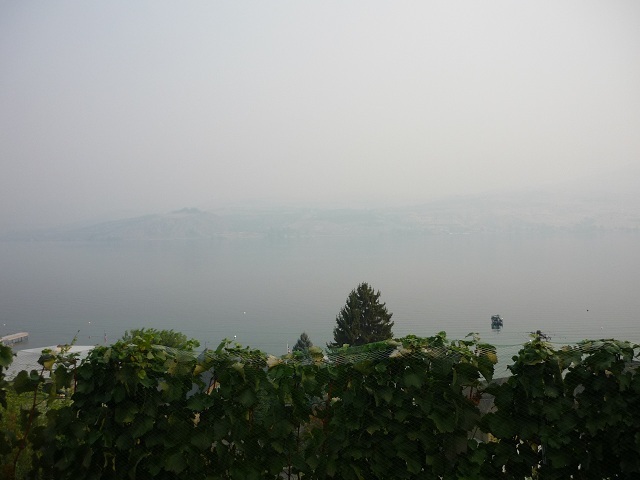 The smoke from this complex of fires has been so thick that it has been difficult to see from one side of Lake Chelan to the other in the nearby town of Chelan, with the air quality called ‘hazardous’ by the Washington Department of Ecology. While the flames are further away, other wildfires brought smoke to the Walla Walla Valley last week, dropping ash in some vineyards. Areas of the Yakima Valley have also been hazy with smoke noticeable in the air. The obvious question is will this smoke have any effect on the state’s grape harvest? The answer is difficult to determine at this point, although growers and winemakers remain hopeful that smoke taint – which has affected wines in Australia and California in the last decade - will not be an issue in any of the state's growing regions. Many factors are involved in creating smoke taint in wines, including the distance of the vineyard from the fire, the density of the smoke, and the duration of the grape/vine contact with the smoke. Research has also shown that the absorption of smoke related compounds differs across grapes varieties, with some more susceptible than others. Unfortunately, there isn’t currently a full understanding of the contribution of all of these variables or even the full equation. How do wines made from smoke tainted grapes ultimately present themselves? On a sensory level, according to Australia’s Vinessential Laboratory, wines affected by smoke can have aromas and flavors described as ‘burnt’, ‘ashtray’, ‘charred,’ ‘salami,’ and ‘disinfectant.’ In the laboratory, Guaiacol and 4 methylguaiacol (G and 4MG) are marker compounds for smoke taint and are measured by Gas Chromatography Mass Spectrometry. These compounds can be tested in grapes, fermented juice, and finished wine. Australian based Memstar notes, however, that G and 4MG levels in grapes and juice are not reliable predictors of smoke taint in wine, as these compounds are not in a free form until after fermentation. Additionally, their concentration increases over time in finished wine as they are released from their bound form. There are steps growers and winemakers can take to reduce the potential effects of smoke taint. According to the Center for Expertise in Smoke Research at the Victoria Department of Primary Industries, smoke taint can be reduced by hand harvesting, chilling grapes, and altering pressing methods. WSU recommends reducing skin contact time, conducting whole cluster pressing, and separating free run and press juice. They also note that some strains of yeast lessen the effects of smoke taint, while some other forms of yeast exacerbate it (read the entire newsletter here). For wine affected by smoke taint, research has focused on trying to remove it by using fining agents (read an example here). Reverse osmosis has also been used but research has shown that this is only temporarily effective with the taint returning over time. Ultimately, it remains to be seen whether the smoke in eastern Washington will have a significant effect - or even any effect - on any of the wines produced in 2012. A number of wineries are currently testing the grapes they have harvested thus far for any evidence of smoke taint. Notably, some areas of eastern Washington experienced some clearing of the smoke over the weekend with rain also falling in a few areas. Stay tuned. Outside of the smoke, the otherwise favorable weather has continued to ripen grapes in the vineyard, and winemakers remain excited for what the 2012 vintage holds. While the last two years the grapes reached physiological ripeness and winemakers waited for sugar accumulation, this year marks a return to previous years with physiological ripeness lagging. “I think the biggest challenge this fall will be to have patience as we see the sugars climb and to pick when the grapes are physiologically ripe,” Bigelow says. “We have picked only one red so far, and that is Ciel du Cheval Merlot." Bigelow says that he was originally planning to pick more grapes but held off. "I initially had these (blocks) scheduled for last week, but after tasting and running acids on the samples it was clear the vines have more to give, and I am glad I waited." Meanwhile Sean Boyd of Woodinville Wine Cellars agrees about the good weather, saying, “This last week has been ideal as has the last ten to twelve weeks or so.” Boyd says that he expects harvest to continue for him into the third week of October assuming the weather holds. Read previous harvest updates here. Satellite image from National Aeronautics and Space Administration. Picture of smoke on Lake Chelan courtesy of Chelan Estate Winery. Terrific and very thorough report Sean. Thank you!